Traveling. I am still finding it like a magnifying glass on life, showing how things always are, but in unusually vivid ways. This time, the life-truth that when things don't seem to be working out as planned, a little bit of openness, awareness, and space for intuition may help lead to unexpected wonders that far exceed those plans. Usually it takes years and a birds-eye reflection on things to notice it. On the road, it can manifest in just a few days, making this lesson unavoidable. Our plan: Travel from the cool beach town of Huanchaco, Peru, where we had been visiting the pre-Inca ruins of Chan Chan and enjoying amazing ceviche (seafood cooked by citrus juice rather than heat) and Pisco Sours (Peru's national drink made with a grape liqueur, lime, and egg whites that somehow ends up tasting a lot like a strong but tasty margarita). Head to Caraz, Peru, a small town in the northern end of the Cordillera Blanca mountains (the world's highest tropical mountain range), to do some extended trekking. Maybe a four-day walk into the wilds of the Andes. From Caraz, go to Huaraz, a bigger city a bit further south, also nestled in the Cordillera Blanca, to see what other mountain adventures we could find. What happened: We went to buy our bus ticket in Trujillo, a major city about twenty minutes from Huanchaco. The cashier explained that the bus ride to Caraz would be about ten hours. Since we also planned to go to Huaraz, we asked her how long that ride would take, and she said nine hours. We thought the opposite should be true since Huaraz is south of Caraz, but when we asked the cashier, she told us that Caraz is further south than Huaraz. This didn't fit with our memory of the guidebook or the map – but since we had neither of them with us at the time, we figured this Peruvian bus expert must know better than us. Assuming we must have reversed the two cities in our mind and not wanting to make another trip to Trujillo to buy the ticket later in the day, we paid for a ticket to Huaraz with a plan to travel “south” to Caraz after that. We learned to trust Peruvian bus ticket cashiers about as much as one should trust Peruvian public clocks – which is to say, not at all. (Actually, truth is, many of the ticket cashiers were extremely helpful.) Upon checking the guidebook back in Huanchaco, we found that Caraz IS north of Huaraz – so we would be passing up the town that sounded like a much better trekking base to us – and the ticket was pretty clearly unexchangable. By the way, if all of this talk of “Huaraz” and “Caraz” has your head spinning, I should also mention that there is another town located between the two, named “Carhuaz” -- just to keep everyone listening with close awareness to figure out which town is being mentioned. Guido went on to tell us about the history of the town. During the first half of the twentieth century, the town was a Hacienda – a system somewhere between indentured servitude and flat out slavery that wealthy Peruvian mestizos (part-indigenous; part-Spanish) subjected the oppressed indigenous peoples to. For example, in 1951 in the town of Vicos, one male from every family had to provide the Hacienda owners 159 days per year of agricultural labor. Women and children cared for the Hacienda herds. Additional labor was required of women as cooks and as household servants. Men had to give extra labor as Hacienda guards and to care for Hacienda horses. In exchange for their labor, the Vicosinos received the right to use small plots of land for farming and grazing, just enough to eek out survival. The Peruvian Hacienda system was eventually abolished in 1969. But Vicos has a really unique history in that researchers from Cornell University connected with the town in the 1950s and developed a program aimed at improving the economic and social conditions in Vicos. Their effort promoted democracy and modernization. There were some negative consequences, including a severe loss of local crop biodiversity (mostly potato) because the project promoted growing large quantities of a few "improved" varieties of potatoes marketable in Lima. (Luckily, women, who were excluded from the project, had the wisdom to preserve many of the traditional crops, which with the help of modern NGOs, have now been restored.) But the Cornell project was successful in pursuing legal avenues that allowed the Vicosinos to obtain the lands they had tended and end the Hacienda that had enslaved them. A traditional Quechua town has been consistently maintained there since that time, currently with about five-thousand residents. (If you want to know more about the history of Vicos, check out http://courses.cit.cornell.edu/vicosperu/vicos-site/index.htm). A Better Plan Emerges: We both quickly appreciated that time in Vicos could be an opportunity we would really regret passing up. We had set out on this world-wide journey with the hope of engaging with people all over the world living lives in ways different from our experiences in the US, so that we could return home with fresh perspectives and broader vision. In fact, I was particularly inspired to go on this trip from the brief time I spent in the homes of locals on the Island of Tequile and the town of Cabanaconde when I was in Peru in 2000; it had opened my eyes to the truth that humans can be so much happier than most Americans seem to be with so much less material wealth and resources than most Americans have. This was a chance to dive in to such a world a little bit deeper. And the townspeople of Vicos have been offering homestays since 1999 after obtaining a lot of training in how to do it well; they are dedicated to sharing their way of life with visitors and enthused about its potential as an alternative source of income for the town. In fact, the fees for participating are shared among the families involved in the project, with a sizable percentage going to the town's social services. After walking around Huaraz for a few hours to think about it, we returned to the California Cafe and signed up with Guido for three days in Vicos. (By the way, should any of you be inspired to do a homestay in Vicos, Guido now has a website set up for his Center at www.respons.org. Also, the great Seattle-based sustainable tourism company, Crooked Trails, organizes visits. ) By this time, word had spread that the strike would not continue, so we could leave for Vicos the next day. The next day we were met by Pablo, a Vicos resident who would help us get to Vicos. We were joined by two Dutch travelers who were studying to be teachers and were volunteering for a month in Vicos to help improve their school program. Also joining us was Malou, a Dutch student of sustainable tourism who was completing her thesis work examining the tourism program of Vicos. Because she is fluent in Spanish, we had agreed to pay for her to join us for our three days to be an interpreter for us. We wanted to get the most out of our visit. And in the process we were essentially sponsoring one of the many visits she needed to make to complete her research – a cause we both felt was worthwhile. Our group traveled by Colectivo to the town of Macara, where we transferred to a taxi for the climb up the mountain to Vicos. Just to give you some sense of the amazing beauty of the area in which Vicos is located, parts of the land owned by the Vicosinos now fall within the Huascaran National Park (and are still farmed by them through an agreement with the government). With peaks like Mount Huascarán (more than 22, 000 feet tall), beautiful glacial lakes, a wide variety of vegetation, and home to animal species like the the spectacled bear and the Andean condor, it is not surprising that the park is a UNESCO World Heritage site. The town is located at about 11,000 feet, at the base of the 20,000 foot Copa Mountain. We were greeted in the main plaza of Vicos by several Vicosino men who toured us through a small but touching museum celebrating the history of their town. We then made the long walk with our full backpacks on our backs (we weren't planning to return to Huaraz, so we couldn't leave our bags there) up the mountainside toward the home of Julio, our host father. We made one stop on the way for some herbal tea – made by sticking stalks and leaves of herbal plants into a cup of boiling water. Coca. Anis. Several types of mint. The best herbal tea I've ever had and we drank it throughout our stay. Then we finished the walk and settled into our home for the next three days – a simple mud-brick building with three bedrooms (qualifying it as a 'hospedaje' or hotel) with a dirt-floor central room and a dining table in one corner. Just outside the front door is a cramped cooking space and a bit further is a clay-oven. A simple but modern out house, like one you'd find at a Washington State trailhead, is also nearby. We spent the afternoon making a large quantity of simple pita-like breads, that were then shared with neighbors and were a staple of our meals during our stay. Dinner consisted of vegetable-based soup with Trigo (a type of grain) and some potatoes. Miral was feeling tired, maybe from the altitude and headed to bed early. With Malou serving as translator, I spent some time talking with Julio that night. He shared photographs of past visitors, as well as photos from the two big journeys he had gone on – one to Puno, Peru, for a cultural exchange with indigenous people there in the Lake Titcaca area, and an invited trip to Italy. He proudly displayed certificates and awards he has won for his diverse farming – he alone grows over 150 varieties of potatoes! -- and listed off material prizes he has also won (“A big cooking pot. A wheelbarrow. That shovel there in the corner. All of these things I won because of my crops.”). Miral, Malou, and I had agreed that we would spend our one full day in Vicos hiking up to a lake at the highest points in the Cordillera Blanca – so we went to bed fairly early. I climbed under several blankets dressed in every layer I had available to manage the cold mountain night in our unheated home – and slept very comfortably. We awoke the next day to a breakfast of the bread we had made, leftover soup from the night before, and an interesting gelatin-like drink that had quinoa suspended in it. We were later told the gelatin is made by fermenting yucca for over a year. Miral and Malou didn't care for the stuff, but I developed a taste for it. I think I just love anything with quinoa in it. Miral was still feeling rundown and decided to skip the day of hiking – instead spending it in the kitchen of Julio's wife, Fausta, who earns money by cooking meals for locals too old or otherwise unable to cook for themselves; a sort of contract-restaurant with the same patrons coming in each day for three meals. Malou and I waited for Pedro, one of the other Vicosinos involved in the tourism project, to arrive to lead us out on our day of hiking to the lake, but he never arrived. So Julio decided we should accompany him to his upper fields, high in the mountains (and within the National Park boundary), where he and his neighbors would be tending to his potato crops. Like most Quechua villages, Vicos is maintained, in part, with a neighborly work-share system. Groups of neighbors will gather together and spend the day attending to the needs of one townsperson with the expectation that that person will then provide a day of labor to them at some point down the line when they are in need of assistance. It's a simple but really beautiful system. So, our group of about seven male neighbors, accompanied by Julio's daughter who would serve as cook for the men, and an agricultural researcher studying local biodiversity for a Peruvian NGO, piled into a mini-van supplied by the NGO, and made the hour-long drive along poorly maintained dirt roads up to the potato fields. The sun was shining and the highest snow-capped peaks of the Cordillera Blanca played hide-and-go-seek with us along the way, making for a gorgeous journey. Damage to the underside of the van after a rock was hit and getting stuck in the mud provided a few chances to stop and really take in the scenery. The men had to argue their way past the guards at the border to the National Park since they apparently didn't have papers necessary to prove their right to access the land -- but after a few minutes they let us through and we were driving past rivers just about to exceed their banks and massively overflowing waterfalls (“mucho lluvio”) and into a valley formed by coal-black rock mountains. The land was increasingly dotted by ancient-looking stone walls marking various plots of farmland – and some farm animals and a few other Vicosinos wandered the hills. After about ten final minutes of extreme bouncing on the dirt road, the van finally came to a stop. A three-liter bottle of Coca-Cola was shared by all, and the townsmen pointed up the hillside to a set of small farm plots, explaining that was our destination. We climbed the hillside and arrived at a cave that is used by Julio and others as a makeshift home when they need to spend extended periods tending to their crops. We sat in a circle in the cave and a second serving of breakfast was shared – more bread and more yucca-gelatin with quinoa. After the meal, Julio pulled out a plastic Inka Cola bottle (Peru's favorite soft drink – now made by Coca-Cola Company). When he pulled the cap off, the smell of strong alcohol quickly filled the cave. The bottle of grain alcohol was passed around the circle with a small glass – each person poured one glass to the dirt floor as an offering to Pachamama, requesting that she provide the crops needed by the town, and then poured another glass down their throat. Shots of grain alcohol rarely go down well – but at about 9am they really hurt! Some of the grain alcohol was then mixed with Coca-Cola and circulated around the circle. 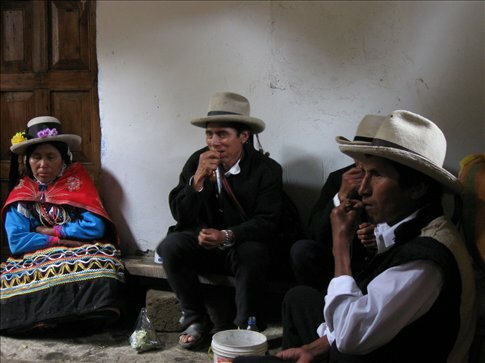 All of the men also chewed coca leaves. They stuffed the leaves into their cheeks and added bits of lime, kept in little wooden boxes with an ornate metal stick that was pounded into the box several times before being removed and placed into their mouths. The lime activates the coca leaves, eliciting a mild form of the stimulant within the leaves that, if they were better refined, would create cocaine. I had learned in my reading years before that coca is chewed almost constantly by Quechua people to provide them energy and suppress their appetites given their meager diets. I tried some of the coca, too – and had the same experience as when I tried it during my visit to Cusco in 2000 – it made my mouth very red and very numb, but provided no real feeling of a stimulant. It must take a lot of Coca leaf – which is why they chewed so much of it. After more than an hour of this ritualized beginning to the day, the men departed the cave and began to attend to their mission: to cover the base of the potato plants with soil to limit the ability of birds to feed on the plants. So row by row within these mini fields terraced into the side of the steep hills, the men covered the plants. Malou and I spent most of the time watching the men, talking about our cats at home that we missed, and taking in/photographing the scenery. I also talked with the researcher, who was fairly fluent in English from two years of graduate study at Bastyr University near Seattle! He helped me to see the barely noticeable distinctions between different types of potatoes and explained that most of the types they were growing can't be sold at market because they are very small and “No one wants potatoes this small; they're not worth anything.” Not worth anything to the rest of the world – but the target of offerings to Pachamama precisely because these people could not survive without them. I helped with a few rows of the crops before the call to lunch was made. We climbed back into the cave. Poured out onto a sack on the floor in Louisiana Crawfish Boil style were a startling and beautiful array of boiled potatoes. Gathered there together, the varieties formed a beautiful bouquet – white, orange, and purple potatoes of various shapes and sizes. As we settled in, one of the men explained that his family had sent some food for the group – a pot of stewed potatoes. Another man explained the same, and offered up a pot of fried potatoes. It was only a small plate of red onions mixed with tuna fish that added any variety (and protein!) to this Fiesta de Papas! The meal was capped off by a few more rounds of Coke and alcohol, and another extended period of coca leaf chewing. Most of the men then returned to the fields. Malou, the researcher, a few of the younger Vicosinos, and I remained in the cave – spending most of the time with the researcher explaining life in the US to the Vicosinos. “In the United States when you get on a bus, you are lucky if there is one other person on the bus with you.” The contrast to the jam packed buses of Peru brought raised eyebrows from the boys. “It's because every person on the United States has their own car and they want to drive it and not be on a bus.” More raised eyebrows. He told the boys about the cost of a home in the US – and the typical size of these homes. He described American supermarkets and the typical American lifestyle. His explanations seemed to reflect his amazement about the glory of that lifestyle and seemed like he wanted the boys to know about bigger possibilities they could find out in the world. But sitting in that cave with these beautiful people, dedicating their day to making sure that their neighbor had enough potatoes to get by that year, I felt mostly embarrassment about the selfish decadence of the American way of life. At one point the researcher lamented, “In your country, cars are so cheap and gas is so cheap. In our country, cars cost many times what they cost in the US, and the same is true for gas. Why is this backward? We are so poor and you are so rich! Very few people can afford to have a car here.” But his comments then turned to reflections on the cost of medical care in the US – and the cost of university education. Again, the boys were astounded. He explained that he could not afford dental work when he was in the United States and how he had to wait to return to Peru, where the government provided such care. What an odd country we are – so invested in keeping automobiles and gasoline affordable to sustain our oil-based economy, while large portions of the population struggle to keep their bodies healthy and to grow their minds. Maybe some of these priorities will be re-assessed by our new President. By about 2pm, the signal was given that the workday was complete. As we climbed down to the van, the skies began to cloud, the temperature dropped, and the afternoon rain began to fall. As we made the drive back down to town, we periodically passed other Vicosinos on the road, walking back to town from their day in the fields. Until the point that the van was jam packed, the van stopped for each person, offering a warm, dry ride home. As each person entered the van, they drank some alcohol to warm up. The already warmed members of the team of neighbors also continued to drink alcohol as we drove home. The conversation in the van was loud and gleeful. As we approached the edge of the farmland and got ready to leave the National Park area, the neighbors noticed cows grazing in a potato field. The field didn't belong to anyone in the van – but without any hesitation at all, the van emptied, the cows were shooed out of the field, and the rock wall that they had knocked down to gain entrance was repaired. These simple acts of compassion and care seemed like a completely obvious response to these people. Yet how many Americans would stop their drive home from work because they happened to notice a problem? Our great modern world – so lacking in basic neighborly decency. Reflecting on the deep connections within the town, I found myself wondering what profound sadness must fill this town when one of the neighbors dies. About an hour later, we were back in Vicos. Miral gushed about her day in the kitchen with multiple generations of Vicos women. And as soon as Fausta heard our voices, she immediately said, “You must be hungry from your day in the fields. Sit and eat.” Really? More food? We had about four-thousand potatoes in our stomachs!! We knew food was a precious commodity to these people – yet all they seemed to want to do was feed us. Feeling bad about refusing her bowl of – you guessed it – potatoes, this time in soup form, Malou and I offered it to the family dogs, who gobbled it down. A few hours later, we were sitting at the dinner table with more food in front of us. After dinner, Julio and the three of us sat at the table in mellow moods, telling some stories and enjoying one another's company until Julio started a fire in the bedroom fireplace and we all called it a night. The next day was spent being led around the village by Pedro, paying visits to the artisans of the town to see how they create their goods and to buy any we liked. Miral bought some very fuzzy alpaca wool socks and I bought a great alpaca wool hat and a woven coca leaf bag that seemed perfect for holding the objects I use on my traveling shrine. Along the walk, Pedro gave us the name of every tree, flower, and crop we passed. He pointed out who lived in many of the homes we passed and who worked which farm plots. He also knew the lineage of many of the farm animals – pointing out pigs that were the offspring of his pigs that had been sold to neighbors. This is a man connected with his environment in a very straightforward and beautiful way. I couldn't imagine being able to walk around any of the towns or cities I have lived in over the years with even a fraction of his awareness. After the meal and some grain alcohol consumption and some coca leaf chewing, the men of Vicos sat down with us. Each man explained with pride his role in the tourism program, sweetly offering their full name as they completed each description. The current President of the group then offered to answer any questions we had. It was really interesting to watch their answers to our admittedly abstract questions repeatedly miss the mark of what we were asking -- about how they see their place in the world, what they would want to offer the world, and about their spiritual traditions. Their answers made clear that their world is one of direct relationship with one another and with their environment, not one of conceptual concerns and cognitive wonderings. And there was something very beautiful and telling about the disconnect that occurred as they answered our questions. There was also something very beautiful about the time they took to talk with us, clearly motivated by a deep intention to share themselves with us. The mood was quickly lightened as our hosts then made an attempt to teach us some traditional dance steps. After a few group photos, it was time to hug the families good-bye. They kindly offered us hand-made wooden utensils as a parting gift. A Colectivo ride down the hill – a farewell hug to Malou – and Miral and I were on our way to Caraz (yes, Caraz, finally!!). We left the town of Vicos behind, but as I write this nearly a month after our visit, the experience of these people with their strong relationships with one another and precise knowledge of their world certainly still resides in me. I think a lot about hos different their balance of experience is – they live very hard lives, yet with such dignity and beauty. The lessons from these few days continue to percolate. I think they will for a very long time. By the way, if you want to read a bit more about staying in Vicos – including mention of our host family, check out: www.msnbc.com/id/25951256. Man, I could certainly use a big bag of Coca leafs right now. I suppose you have heard, Greg Wolk returned to Seattle in December, got dumped by Heather a couple of weeks ago and headed out of town in a rental car today. At Greg's send off yesterday, Rianne told me she was heading back to Holland in June. Change has been a bit more subtle with me. What an amazing writer you are!! You make me feel like I'm in the cave right along with you! Keep having a great time, and stay safe! Send my love to Miral! Glad to hear you guys are well and enjoying your travels. Later.